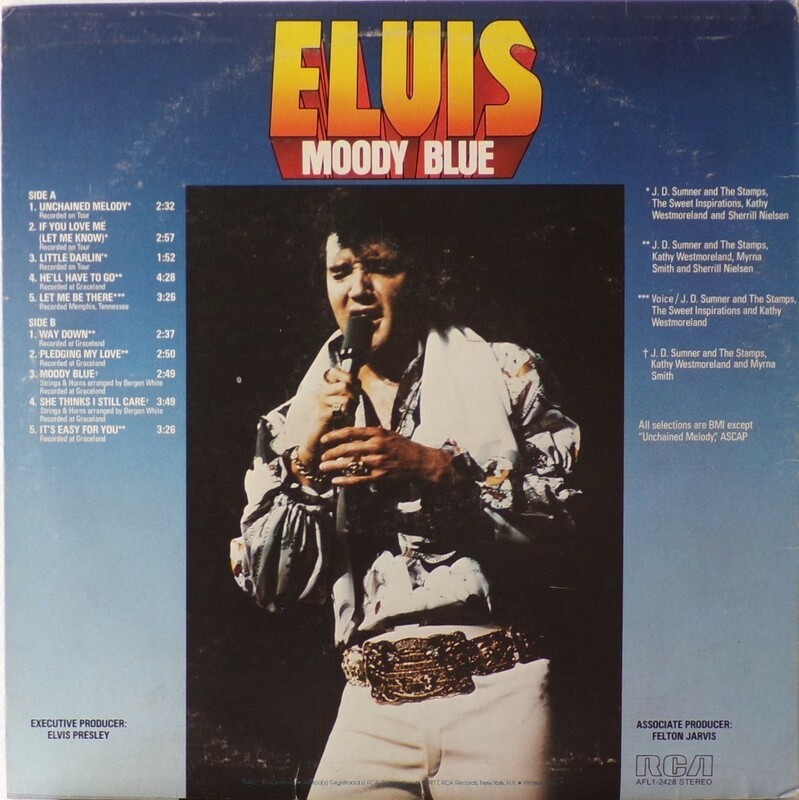 Moody Blue is the final studio album by Elvis Presley. The album was a mixture of live and studio work, and included the four tracks from Presley's final studio recording sessions in October 1976 and two tracks leftover from the previous Graceland session in February 1976. 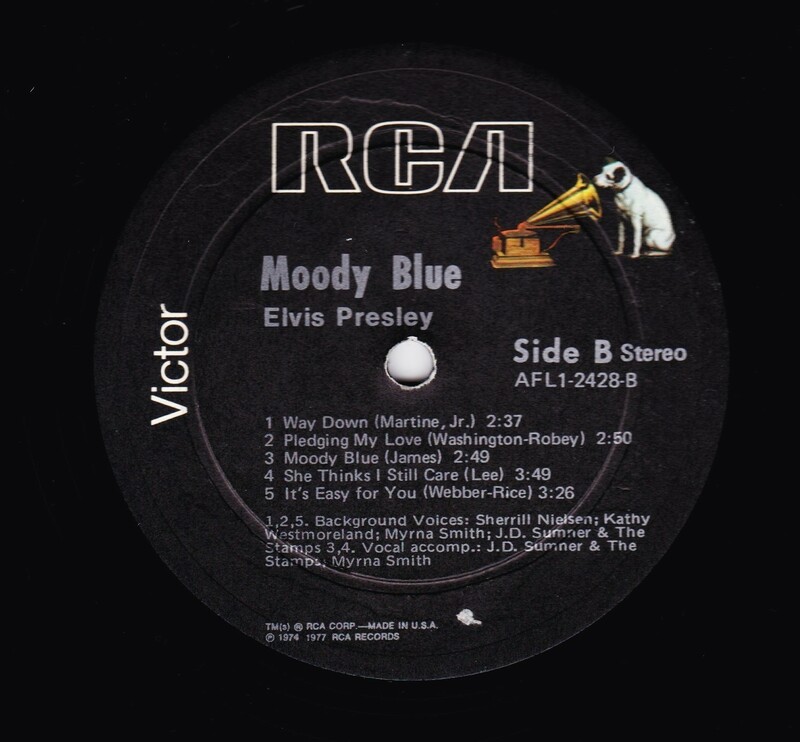 Moody Blue was a previously published hit song recorded at the earlier Graceland session and held over for this album. Also recorded at the February session was She Thinks I Still Care. Way Down became a hit after Presley's death less than one month after this album's publication. 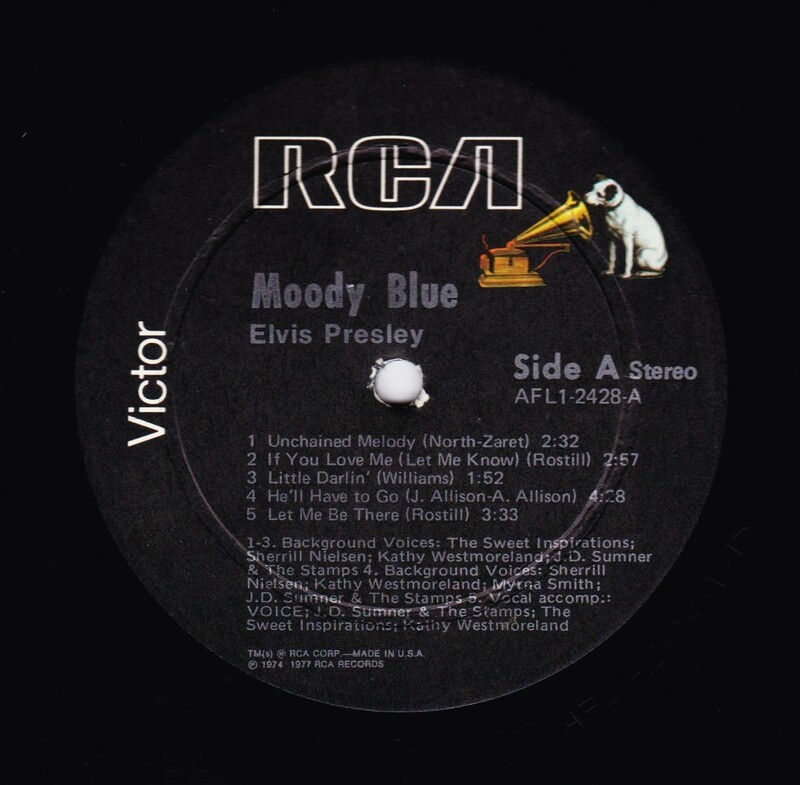 As described in Elvis: The Illustrated Record, RCA was not able to obtain sufficient new studio material for a complete album, with all but six songs of Presley's studio recordings of 1976 having already been used in the previous album, From Elvis Presley Boulevard, Memphis, Tennessee. The company chose to augment the remaining available works with three live songs recorded in Ann Arbor, Michigan, on April 24 and 26, 1977, including his version of "Unchained Melody" which was the album's third single, released posthumously. RCA and the producer Felton Jarvis had booked a recording studio in Nashville, Tennessee, for January 1977, to record some new tracks for this album. Presley had chosen a few songs to record with the help of Jarvis, most of them were rather country and uptempo. Unfortunately, Presley never showed up at that session, claiming that he was sick and thus staying home (an excuse that Presley used rather frequently during the 1960s to avoid recording poor soundtracks for his motion pictures). Jarvis and RCA had nothing left to do but to fill the album with the live tracks mentioned above. Also included is a live performance of "Let Me Be There" which had already been released three years earlier on his album Elvis: As Recorded Live on Stage in Memphis. 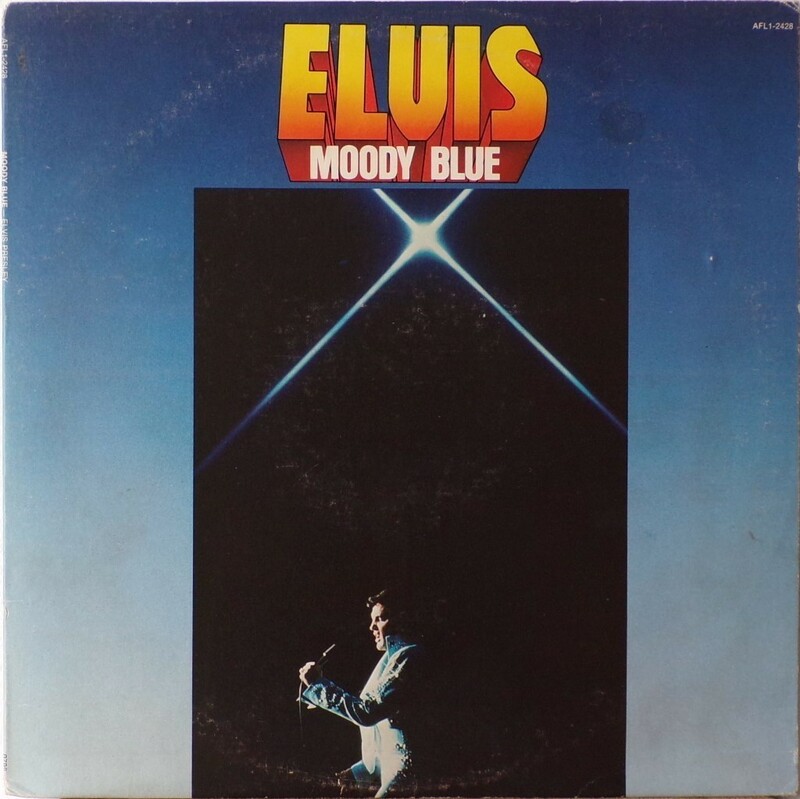 The song Moody Blue was released as a single in December 1976 and it reached number one on the Billboard Country Singles Chart, and #31 on the pop chart. "Way Down" was released as the album's next single during the early summer of 1977. It did not go very far up the chart, but it soared to #18 after Presley's death in August (jumping to number one in the U.K.) It was a bigger hit on the country charts, and it had risen to number one in the same week of the death of Presley. This album reached number three on the Billboard album charts after his death, although it had already entered the top 40 before he died. This was the last album by Presley to reach the TOP 40. 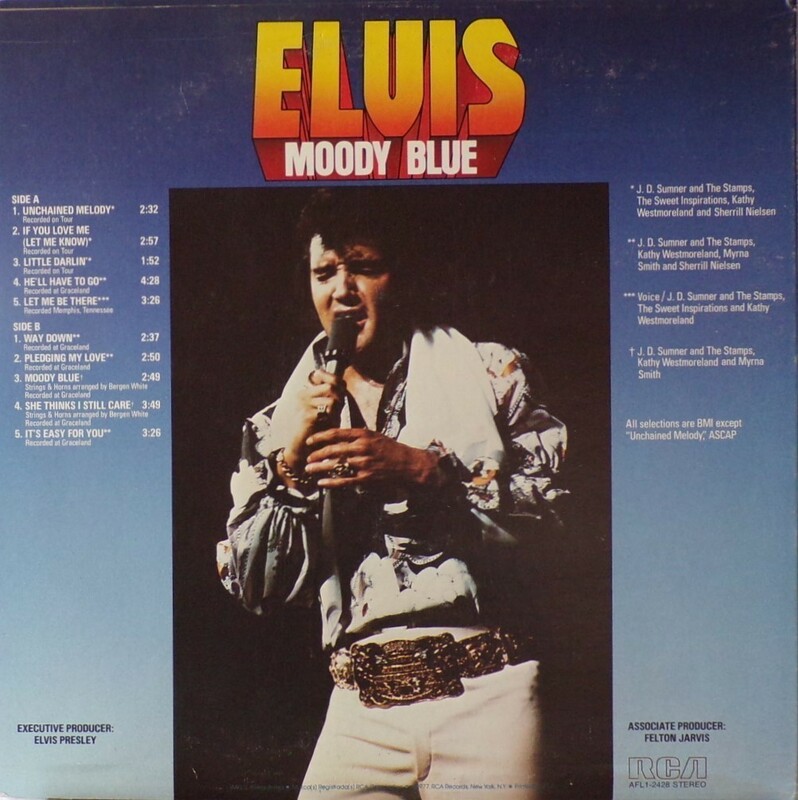 Moody Blue was also a number one album on the Country Albums chart. 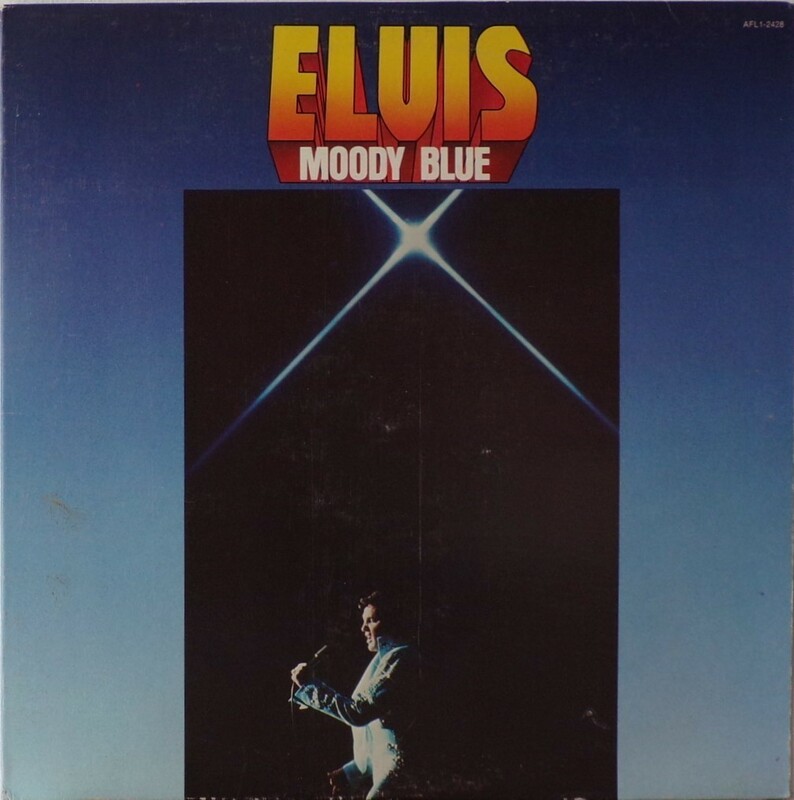 Moody Blue was published on July 19, 1977, and it peaked on the album chart in August 1977. RCA pressed the album on blue vinyl, to match the title track. 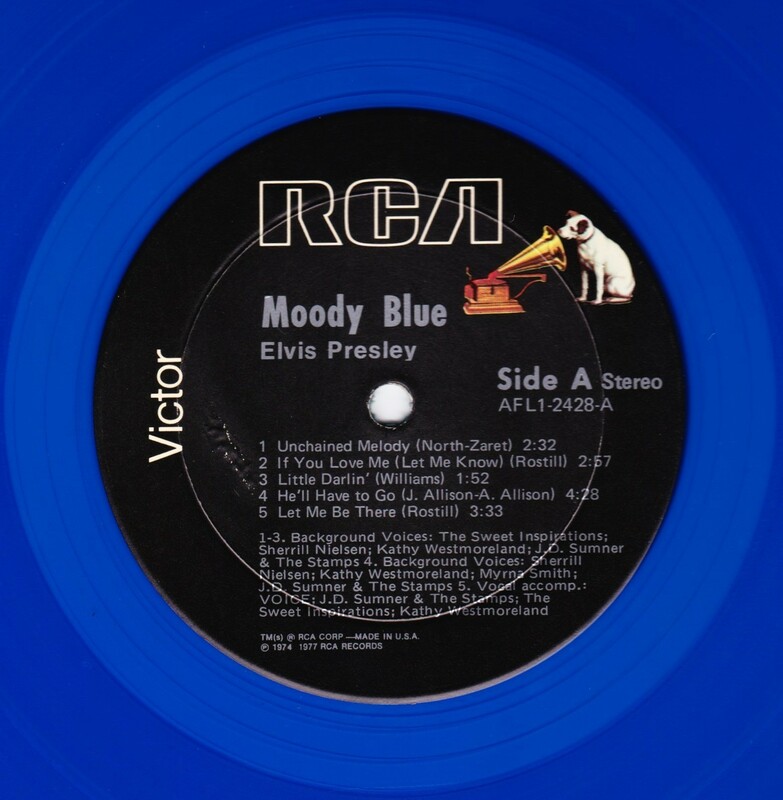 Since colored vinyl pressings were relatively rare, and they almost never occurred in a wide release, this has led to collectors mistakenly assuming that blue-vinyl albums of Moody Blue are collectors' items, when in fact the true collectables are pressings from immediately before Presley's death on standard black vinyl. 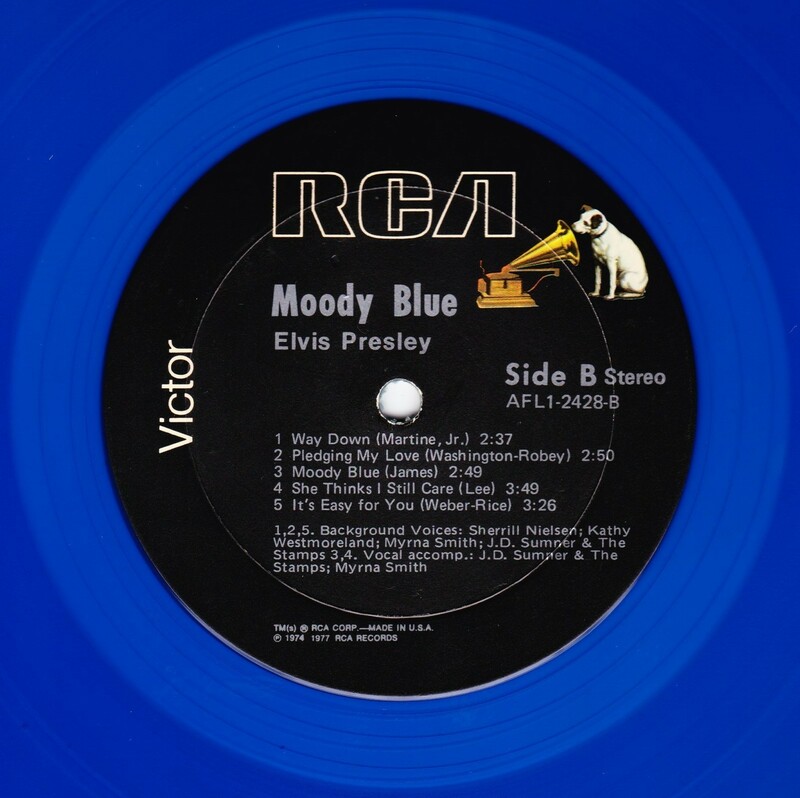 (Immediately following his death, the production of Moody Blue was shifted back to blue vinyl. However, in some later years the album was produced using standard black vinyl). Following Presley's death, "Unchained Melody" was also released as a single, and it peaked at #6 on the country music charts. The original CD issue had the standard songs of the original. The CD reissue of the year 2000 revised the cover art including a different concert photo of Elvis, omitted the track "Let Me Be There", due to its presence on Elvis: As Recorded Live on Stage in Memphis, and it added the complete album From Elvis Presley Boulevard, Memphis, Tennessee as tracks 10-19 - in effect compiling the Graceland sessions rather than reissuing the album. It was certified Gold and Platinum on 9/12/1977 and 2x Platinum on 3/27/1992 by the RIAA. ​​Rear Cover : Photo of Elvis. Catalogue number bottom right. Printed in U.S.A. bottom. Label : Black. Dog near top. *NOTE* This issue released on blue vinyl. Rigid label but flexible vinyl. Label : Black. Dog near top. Non flexible vinyl. *NOTE* New label variation discovered 3rd September 2017 . 14:53 pm. This issue released on black vinyl.